Davis Law Group, P.S. has filed a civil lawsuit on behalf of the victim of a motor vehicle collision caused by an illegally parked semi-truck that took place in September 2015 just off I-90 near North Bend in WA. On September 30, 2015, David Brooks was driving a tractor and trailer owned by Abilene Express Westbound on I-90 in Washington State when he parked it on exit ramp 34’s emergency lane near another parked semi. A “no parking” sign is posted and visible to traffic on exit 34. Abilene Express’ did not pay for reasonable costs, such as parking at a truck stop, which supposedly caused him to park on the exit ramp. The Abilene driver did not have an emergency which required him to park. He was parked in an area that was designated a no parking zone. He knew that it was illegal to park on the exit ramp as indicated by lawfully posted signs, and deliberately chose to disregard the signs. He did not turn on the tractor trailer’s four-way emergency flashers. He failed to set out warning triangles or flares behind the trailer. The Abilene Express tractor trailer was parked on the exit ramp for more than 10 minutes when another truck driver, Travis Logg, was driving a 2000 Pete Tractor DS Westbound on I-90. Logg took exit 34, not knowing that there was an illegally parked tractor trailer parked on the exit. Logg’s semi-truck collided with Brooks’ vehicle causing a major crash that left him with severe and disabling injuries. 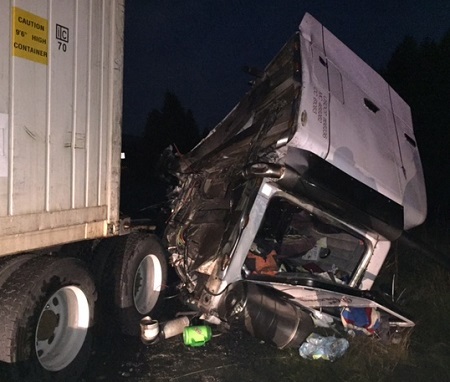 According to a Washington State Patrol (WSP) accident report, around 4:20AM two semi trucks were parked along the off ramp shoulder near Truck Town when a third semi truck cut the gore point at the exit hitting the parked semi trucks. The force of the collision then pushed one parked semi into the other parked truck. Because of this accident, Logg spent weeks in a comma at Harborview Medical Center and many months thereafter for treatment. He suffered multiple leg fractures, broken ribs, shattered knees, a collapsed lung, ruptured spleen, and other injuries requiring numerous surgeries. As a result of Abilene Express’s negligence, Logg suffered serious injuries affecting his activities of daily living and, under the law, is entitled to recover damages for his economic and non-economic damages. RCW 46.61.570 Stopping, Standing or Parking Prohibited In Specific Places. §396 Inspection, Repairs and Maintenance. Abilene Express is required to teach and train its drivers to understand and obey the rules and regulations contained in the FMCSR. The provisions of 49 CFR §301-399, commonly referred to as the “Federal Motor Carrier Safety Regulations” or “FMCSR” are applicable to this case and Abilene Express, and David Brooks were subject to and were required to obey these regulations at the time of the wreck and at all relevant times prior to the wreck. The United States Department of Transportation through the Federal Motor Carrier Safety Administration (FMCSA) issues the public authority to operate the trucking company. Companies authorized by the FMCSA to use tractor trailers on the roads and interstate transportation receive a DOT number. Trucking companies and their drivers are required to obey the minimum safety standards established by the Federal Motor Carrier Safety Regulations (FMCSR)(49 CFR §301-399) either directly or as adopted by the Revised Code of Washington. About Abilene Motor Express, Inc. Defendant Abilene Motor Express, Inc. is a Virginia corporation transacting business in the state of Washington. Abilene Express is an interstate common carrier based out of Virginia. Abilene Express is registered with the U.S. Department of Transportation under DOT # 335555 and MC194957. Abilene Motor Express is the employer of defendant truck driver David Brooks of Danville, VA.
Abilene Express is the registered owner of U.S. DOT # 335555 and MC 194957, displayed on the tractor involved in this wreck, and is therefore responsible for the acts of the driver of the vehicle. Abilene Express and its drivers have a duty to maintain the tractor and trailer in satisfactory working order to ensure the safety of citizens on the roads, interstates, and highways. "I am sorry that I didn't call Chris Davis earlier" -Joe C.